Leah Hogsten | The Salt Lake Tribune l-r Pam Harrison of Ogden holds a sign for U.S. Representative for Utah's 1st congressional district, and Chairman of the House Natural Resources Committee, Rob Bishop to see after a meeting with Susan Combs, the Interior Department's Acting Assistant Secretary for Policy, Management and Budget in Ogden, Aug. 28, 2018 to hear how the Department of Interior reorganization could benefit Utah. Ogden • One thing is certain under the major reorganization Interior Secretary Ryan Zinke has in mind for the sprawling federal department he oversees: The Bureau of Land Management headquarters will move West, where nearly all the nation’s public land is concentrated. Salt Lake City has been viewed as a logical host city, but now an up-and-coming city 40 miles to the north has emerged as a possible contender. A top Interior official, Susan Combs, toured northern Utah on Tuesday and joined a panel with Weber County commissioners extolling the virtues of Ogden, a historic rail town that now prides itself as one of the nation’s hottest outdoor recreation cities. 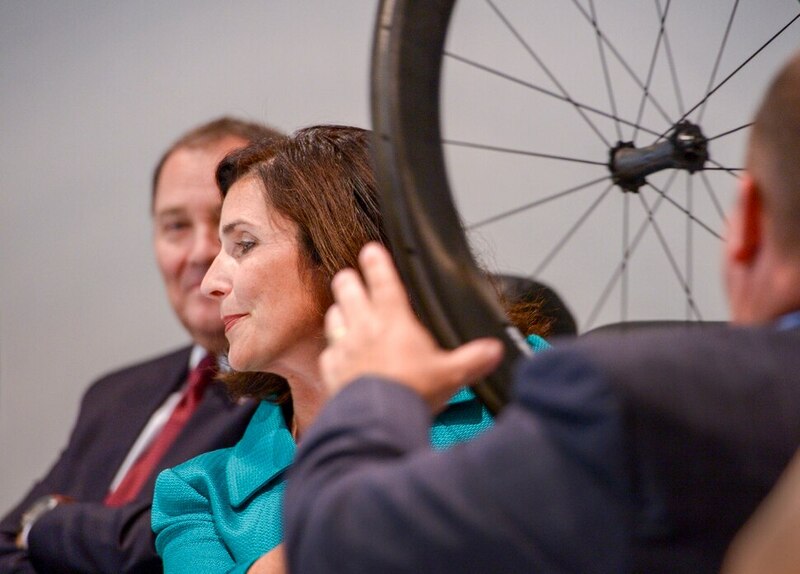 Leah Hogsten | The Salt Lake Tribune Sarah Lehman, CEO of Enve Composites brought her company's product, a carbon fiber bicycle wheel before a panel, including Susan Combs, the Interior Department's Acting Assistant Secretary, U.S. House Committee on Natural Resources Chairman Rob Bishop, Governor Gary Herbert, Utah representatives, Weber County elected leaders and a business owner during a panel discussion in Ogden, Aug. 28, 2018 to hear how the Department of Interior reorganization could benefit Utah. Leah Hogsten | The Salt Lake Tribune Susan Combs, the Interior Department's Acting Assistant Secretary for Policy, Management and Budget met with U.S. House Committee on Natural Resources Chairman Rob Bishop, Governor Gary Herbert, Utah representatives, Weber County elected leaders and a business owner during a panel discussion in Ogden, Aug. 28, 2018 to hear how the Department of Interior reorganization could benefit Utah. Leah Hogsten | The Salt Lake Tribune l-r Pam Harrison of Ogden holds a sign for U.S. Representative for Utah's 1st congressional district, and Chairman of the House Natural Resources Committee, Rob Bishop to see after a meeting with Susan Combs, the Interior Department's Acting Assistant Secretary for Policy, Management and Budget in Ogden, Aug. 28, 2018 to hear how the Department of Interior reorganization could benefit Utah. Leah Hogsten | The Salt Lake Tribune Susan Combs, the Interior Department's Acting Assistant Secretary for Policy, Management and Budget met with U.S. House Committee on Natural Resources Chairman Rob Bishop, Governor Gary Herbert, Utah representatives, Weber County elected leaders and a business owner during a panel discussion in Ogden, Aug. 28, 2018 to hear how the Department of Interior reorganization could benefit Utah. Leah Hogsten | The Salt Lake Tribune Governor Gary Herbert, center, draws a laugh from the crowd after asking Susan Combs, (not shown) the Interior Department's Acting Assistant Secretary for Policy, Management and Budget when the Department of Interior would relocate its regional office to Utah. Combs met with Herbert, U.S. House Committee on Natural Resources Chairman Rob Bishop, House legislators, Weber County leaders and a business owner during a panel discussion in Ogden, Aug. 28, 2018 to hear how the Department of Interior reorganization could benefit Utah. Leah Hogsten | The Salt Lake Tribune Governor Gary Herbert talks with Susan Combs, the Interior Department's Acting Assistant Secretary for Policy, Management and Budget prior to meeting with U.S. House Committee on Natural Resources Chairman Rob Bishop, Utah representatives, Weber County elected leaders and a business owner during a panel discussion in Ogden, Aug. 28, 2018 to hear how the Department of Interior reorganization could benefit Utah. Leah Hogsten | The Salt Lake Tribune l-r Susan Combs, the Interior Department's Acting Assistant Secretary for Policy, Management and Budget talks with U.S. Representative for Utah's 1st congressional district and U.S. House Committee on Natural Resources Chairman Rob Bishop, prior to meeting with Governor Gary Herbert, right, Utah representatives, Weber County elected leaders and a business owner during a panel discussion in Ogden, Aug. 28, 2018 to hear how the Department of Interior reorganization could benefit Utah. Leah Hogsten | The Salt Lake Tribune Susan Combs, the Interior Department's Acting Assistant Secretary for Policy, Management and Budget meets with U.S. House Committee on Natural Resources Chairman Rob Bishop, Governor Gary Herbert, Utah representatives, Weber County elected leaders and a business owner during a panel discussion in Ogden, Aug. 28, 2018 to hear how the Department of Interior reorganization could benefit Utah. 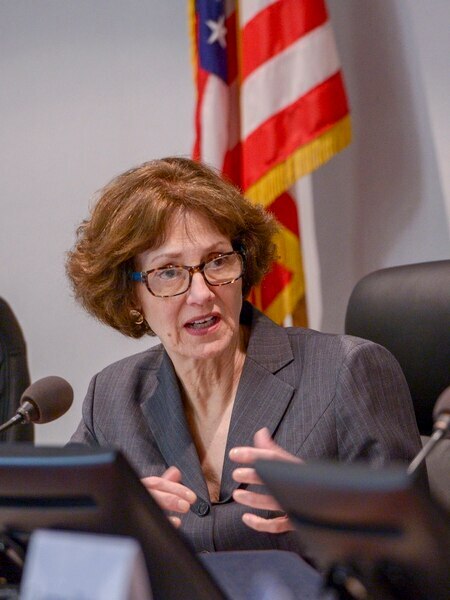 Leah Hogsten | The Salt Lake Tribune Kevin Blanch of Ogden attended a panel discussion with Susan Combs, the Interior Department's Acting Assistant Secretary for Policy, Management and Budget in the hopes of questioning Combs, but the panel adjourned without taking public questions and comments in Ogden, Aug. 28, 2018 during a panel discussion on how the Department of Interior reorganization could benefit Utah. 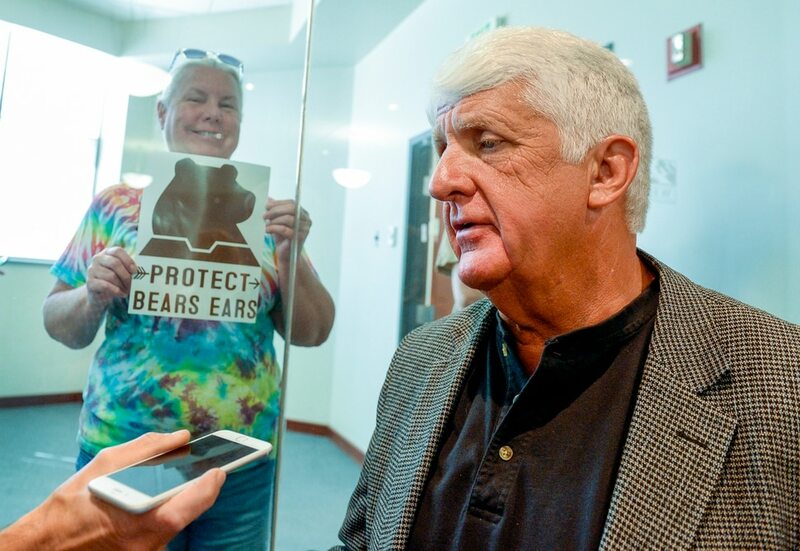 The exchange occurred at a roundtable hosted by House Natural Resources Committee Chairman Rob Bishop, whose congressional district includes Ogden. Combs laid out Zinke’s vision for making the BLM and other Interior agencies more responsive to Western communities associated with public lands. 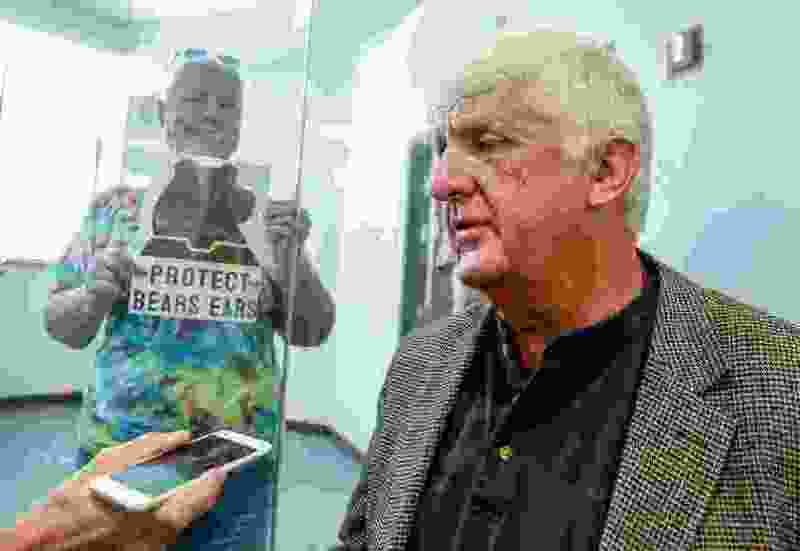 But conservation groups are pushing back against the idea that the Interior Department should grant more deference to local concerns than it already does. Also on Tuesday’s panel were Bishop, R-Utah, and Gov. Gary Herbert, who did not name any particular city when he made his pitch that BLM headquarters belong in the state. Other Western cities under consideration include Denver; Grand Junction, Colo.; and Albuquerque, N.M.
With Herbert inviting the BLM to put its headquarters in Utah, it appears state leaders no longer prioritize taking title to the public lands, a move that would evict the BLM from the state. Instead, leaders are embracing a less drastic goal of securing greater authority over how the BLM manages 23 million acres in Utah. On paper, Salt Lake City would appear to be a more viable candidate than Ogden. The BLM’s state office is already in Utah’s capital city, which also sits at the junction of the Intermountain West’s two biggest freeways. And, Herbert noted, Salt Lake City has a major airport undergoing a $3.6 billion expansion. But Bishop noted that Ogden has plenty of available federal office space and its own airport. Ogden hosts regional offices of the U.S. Forest Service and the IRS; Hill Air Force Base is nearby. The Interior Department oversees the BLM, the National Park Service, the Bureau of Indian Affairs, the Fish and Wildlife Service, the Bureau of Reclamation, the U.S. Geological Survey and other agencies. Last week, Zinke released a map outlining his plan to align these bureaus into 12 common regions. Utah would reside in the largest, sharing a new Region 7 with Wyoming, Colorado and New Mexico. This area currently accounts for 33,000 Interior employees. Herbert believes such an alignment of the Interior Department is long overdue. It can take too long, he argued, for companies to get permits to drill, mine or install utility lines because the department’s agencies don’t coordinate their oversight.